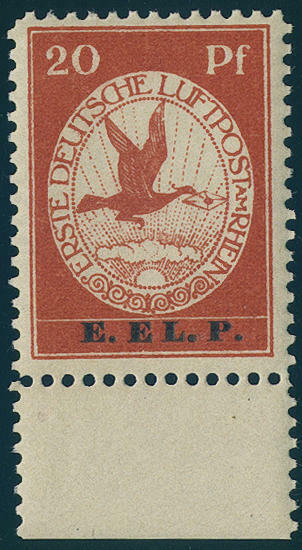 3436 c inF Interesting inventory from silver coins of different areas with sought-after issues, as well Russia, PeopleÂ´s Republic of China, Austria, Canada and so on, all packed in a carton. An attractive lot! 3437 c inF Extensive inventory from 261 silver coins German Empire respectively Third Reich, with also a large number 5 RM Hindenburg and Garnisonskirche, as well also many earlier issues. Treasure trove! Already the silver fineness amounts 1920 Gram. 3438 c inF Rich collection Federal Republic coin sheets in seven ring binder, furthermore as well further coins from the DM and Euro time packed in a carton, please have a look! 3439 c inF Interesting lot coins in the box. With also a gold coin of the United States of America, Federal Republic of Germany commemorative coins abundant including Schiller, margrave from Baden and Eichendorff. 3440 c inF Interesting lot coins PeopleÂ´s Republic of China to the olympic act 1980 with in total 13 copies. 3441 c inF Interesting lot of coins from different areas packed in a carton, with also olympic games and so on. Please have a look! 3442 c inF Nice collection commemorative coins of the Federal Republic in the ring binder, also the first five examples from Germanic museum. Please have a look! 3443 c inF Extensive inventory packed in a carton, as well numerous commemorative coins of the Federal Republic, as well also a gold coin. Please have a look! 3444 c inF Very large inventory in five large boxes accommodated, many nice motives, also medals and so on. Please check carefully! 3445 c inF Small lot coins, with also a gold coin from Canada and so on. Please have a look! 3446 c inF Interesting inventory lot coins, almost only older material, as well lots of German Reich, also emergency coins and so on. Large number of pieces and treasure trove! 3447 c inF Extensive inventory coins packed in a carton, mostly in ring binders, as well issues of different countries including older material, with also German Reich. Please have a look! 3195 medalF Interesting collection medals to different topics, with also Kennedy, Ludwig II. From Bavaria, and so on. The Gold fine weight amounts 83, 1 Gram. 3196 medalF Interesting collection of more than 100 decoration and medals, mainly German Demokratic Republik (East Germany) from 1951. As well scarce issues as for instance German Nationalpreis in gold (750), honor needle of the German academy for sciences in gold (750), Heinrich Grasp price, Arndtmedaille in silver (900), Humboldt medals in gold, silver and bronze, as well also various award Documents and congratulatory telegrams, partly with original signatures from Pieck, Ulbricht and Grotewohl and so on. An extraordinary object! 3197 Plakette Siemens, interesting badge \"Thanks to of the house SIEMENS\" with a diameter from approximate 18 cm, as well also three old historic securities Siemens from 1907 / 13. 3448 x Interesting and extensive inventory from silver medals packed in a carton. As well interesting examples, various motives and so on, partly in caskets accommodated. Enormously acquisition price! Already the silver fineness amounts 700 Gram. 3449 medalF Small lot decoration from the German Reich. Please have a look! 5008 ✉ K22 40 Pfg. 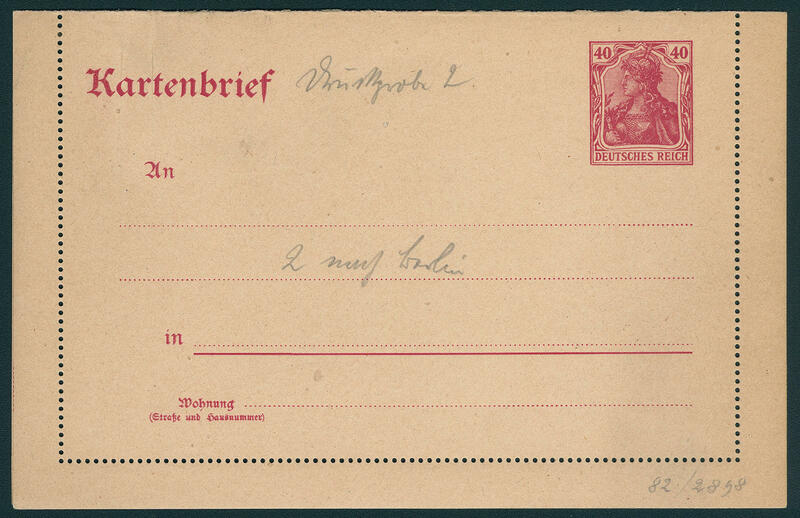 Germania, postal stationery letter-card, amended Carton color (rose white), Munich printing, very scarce trial printing with handwritten notation \"trial printing 2, 2 to BERLIN, 82 / 2858\". Very rare! Expertized Ludin BPP. 4892 ∆ V 10 Pfg. E. EL. 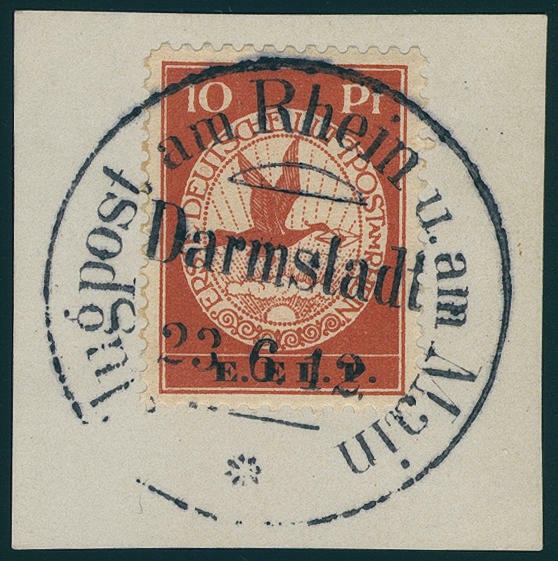 P. 1912, wonderful fresh colors and well perforated on magnificent white letter piece with perfect clear special cancel \"DARMSTADT airmail on the Rhine and on the Main 23.6.12. \". An outstanding quality for the highest standards! Photo expertize \"faultless condition\" Jäschke-Lantelme BPP. 4893 V/VI 10 Pfg. And 20 Pfg. E. EL. 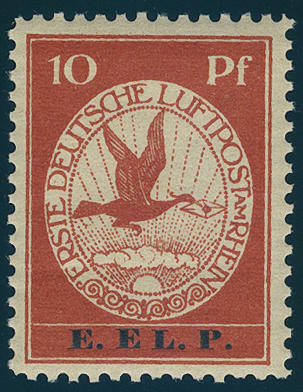 P. 1912, both values wonderful fresh colors and in perfect condition mint never hinged photo expertize \"faultless mint never hinged condition\" Jäschke-Lantelme BPP.